May Day: Workers of the World Unite! 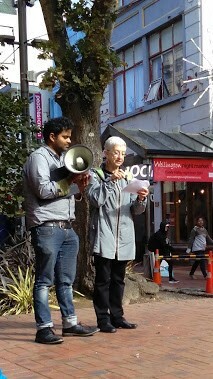 We reprint below a lightly edited version of a speech given by IBT supporter Adaire Hannah at the “May Day March for Migrants and Refugee Rights” in Wellington, New Zealand. We are celebrating International Workers’ Day — May Day — which has its origins in the 1886 Chicago Haymarket strike for an eight-hour-day. It’s become a day of international workers’ solidarity. Clearly migrant and refugee rights fit right in. New Zealand is a country of migrants, some recently arrived and some who arrived a very long time ago. It was a migrant carpenter, Samuel Parnell, who began the fight for the eight-hour day in 1840. Aided by other workers, he promoted this practice to all new arrivals to Wellington. Immigration is an explosive issue around the world today, but it is not new. There were anti-Chinese poll taxes during the late19th century, as well as dawn raids and pregnancy tests against Pasifika [Pacific Islands] migrants in the 1960s and 1970s. Workers must fight against capitalist immigration legislation and discrimination. Communists generally uphold the democratic right of individuals to live where they choose [see “Leninism & Immigration”]. We oppose imperialist countries like New Zealand imposing laws that limit immigration and we demand full citizenship rights for all immigrants! New Zealand governments have been quick to join every imperialist war, but they are miserly and racist about providing any sanctuary for the victims of war. We need class-struggle trade unions to fight against the capitalist attacks which have weakened our capacity to defend ourselves and the oppressed. Only class struggle can improve the lives of working people and defend the interests of migrants and other layers of the oppressed. Our union strength has been severely cut by the anti-worker legislation of the 1980s and 1990s. These laws need to be defeated. Many migrant and refugee workers are being grossly exploited. They must be brought into the union movement. We need to expand union representation by organising union-led membership drives. Victories such as that of E tū [New Zealand trade union] in the aged-care sector is one way of promoting union membership. Standing up for the real needs of migrants, such as rejecting quotas or limiting entry numbers, is another. We need to fight for full citizenship rights for all immigrants. Migrants do not threaten our jobs. They are not responsible for the cuts in services or availability of housing. The obvious inadequacy of infrastructure demonstrates the need for a fight for a programme of public works at full union wages and conditions. There is plenty of work for immigrants without threatening the jobs of any of us. We need to fight capitalist austerity not with anti-immigrant rhetoric but with a fight for a shorter work week at no loss of pay. The fact is that capitalism cannot guarantee the provision of a decent standard of living for the vast majority of humanity. It has outlived its historical mission. Capitalism cannot be fixed. The working class needs to fight for the expropriation of capital, laying the basis for an egalitarian socialist society. Solidarity with refugees from the wars of the imperialist system! Fight for a workers’ government!